Cut the lamb into two inch cubes (working around the bones if they’re in there) and then dry with a paper towel. Brown the meat, only a few pieces at a time, in hot oil in a skillet. After they are browned, put the meat pieces into a relatively good-sized dutch oven. Sprinkle the lamb with the sugar, toss, and then and heat on the stovetop over medium-high heat for 3 minutes, or until the sugar has caramelized. Toss the meat with the salt and pepper, then with the flour. Set dutch oven, uncovered, in the oven for 4-5 minutes. Take it out, toss the meat, and return to the oven for 4 minutes more. (This browns the flour and coats the lamb with a thin crust). Remove the dutch oven and turn the oven down to 350 degrees. Pour out the fat. Pour two cups of veal stock into the skillet you sauteed the meat in. Bring to a boil and scrape up all the good bits that were left over. Pour the liquid into the dutch oven. Bring to a simmer (over the stove again) for a few seconds, shaking and stirring to mix the liquid and the flour. Add the tomato, garlic, thyme, and bay leaf. Bring to a simmer for one minute, then add the other cup of stock. Put the lid on the dutch oven and return it to the oven. Leave it in the oven for an hour, making sure it simmers evenly during this time. While the lamb is simmering, trim the potatoes into ovals, 1 1/2 inches long and cover with cold water until ready to use. Cut the carrots into rounds and quarter the turnips. Quarter the onions. Then, pour the contents of the casserole into a sieve set over a bowl. Rinse out the dutch oven. Remove any bones from the lamb, and return the lamb to the dutch oven. Skim the fat off the sauce in the bowl and pour sauce back into the dutch oven. Press the vegetables into the dutch oven between the pieces of lamb. Baste with the sauce. Bring to a simmer on the stove top and return to the oven. Simmer for another hour in the oven. Boil some salted water on the stove and cook the peas and beans (do this at the tail end of that last hour of simmering). Remove the dutch oven from the oven and skim off the fat. Adjust seasoning if necessary. Add the peas and beans to the rest of the stew. 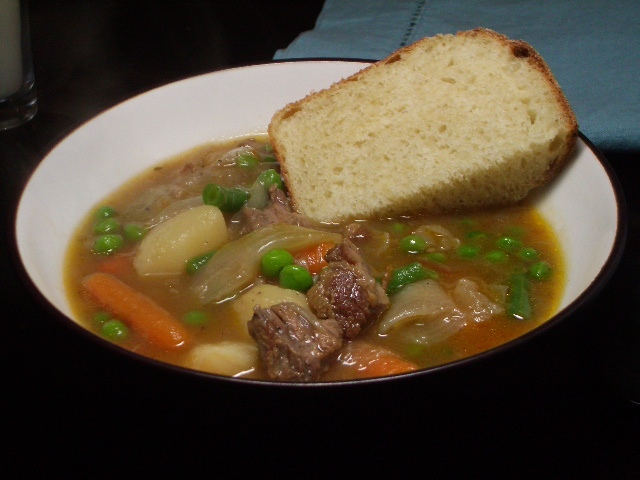 Serve in bowls with a good piece of bread and ENJOY!